Callibri is a massive project intended to create a versatile portable wireless sensor with an extensive set of features and functions in the form of an SDK. 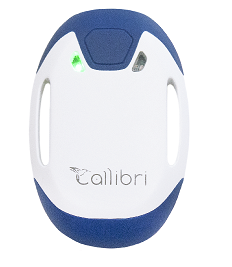 Currently, Callibri sensor is the basic element, which is used to create a wide range of products and technologies. Furthermore, Callibri sensor can be considered as the foundation for various startups of other companies, which develop applications and programs in order to process electrophysiological or biomedical signals. Callibri is able to work with both personal computers and smartphones. The sensor can be connected to a personal computer using one of the wireless interfaces: the proprietary one (2.4GHz) or Bluetooth connection. This document covers the wide range of products developed for such mobile platforms as Android and iOS. The connection between the sensor and the smartphone is carried out using Bluetooth LE interface. • the angular speed and the angular acceleration, as well as the angle of the horizon deviation using the triaxial MEMS-sensor (having a gyroscope and an accelerometer). All bio-electric potentials are registered using a separate lead from the termination pads of the sensor, or by using a special USB cable connected to the device. • creation of the electric stimulus. A special USB-cable is used for the electrical stimulation. Device termination pads can be used to fix the sensor. • Restoring the muscular tone of weak muscles. While working in the stimulation mode by angle values, the sensor is provided with specific vertical\horizontal deviation angle values from the app for the selected axes. The device starts stimulation using the defined deviation angle range and values of current, length and frequency of the impulses. 1. Neural interfaces based on the biofeedback. 2. Fitness and sports training quality assessment system. 3. Various applications based on the registration of EMG, EEG, ECG and the pulmonary rheogram (respiratory movement). • The device can be connected and disconnected. • The information about the current state of the device can be received. • The information about the current battery level can be received. • The information about the functional abilities of the device can be received. • The sampling frequency can be set and received from the device (125Hz, 250Hz, 500Hz, 1KHz, 2KHz, 4KHz). • The process of signal reception can be launched and stopped. • The information about the signal length can be received. • A required part of a selected range (or the entire signal) can be received. • The user is able to receive/set the amplification/shift of the data. • The angle of deviation from the vertical/horizontal for a specific axis can be calculated. This set can be used by mobile application development teams working in the field of Life/Health Tracking for fitness, sports, current health state monitoring and the self-adjustment using the biofeedback methods. It can be used by any other projects, which require a high-quality electrophysiological signal and estimate indicators (the heart rate, the signal power-density spectrum for a specific frequency range of EMG and EEG). For example, such projects may include new developments in the field gaming industry or BCI-related solutions. This page was last modified on 8 June 2018, at 12:02.